Personally I didn’t know what to think of these new D&D rule announcements earlier today, and in regards to the essentials products I’ll just have to wait and see if they’re for me I suppose. I’m always for improving, balancing and making games more fun for everyone and after spending almost the entire day looking into these things, and reading angry posts on ENworld to enlightened twitter posts I think I fall into the “I’m totally stoked about this” crowd. I also happen to belong to the “Magic Missle changes are rad” (also – Dispel Magic) crowd – just to put that out there. Anyway in an efforts to move away from the heavy hearted version debate going on I’d like to share something I made for fun over the weekend. 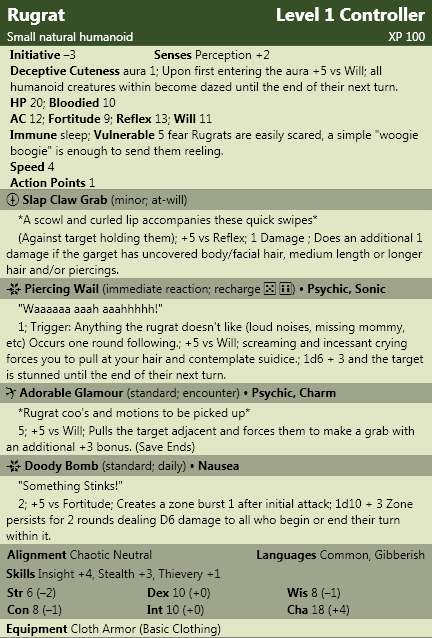 My little monster was being extra cute this weekend and she inspired me to design her straight into a 4e monster statblock. Also I’ll be moving the site soon to my own hosting, and hopefully have a better layout and some cool new features, I hope you’ll continue reading during this process – I do enjoy my few but loyal readers. After the move is complete blogging should resume at a semi-normal pace. Enjoy, and happy gaming!